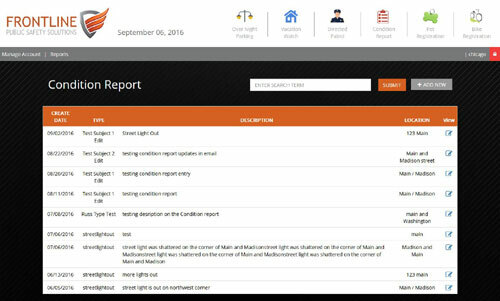 The Condition Report Dashboard is an overview listing of all the community condition calls received by the department. 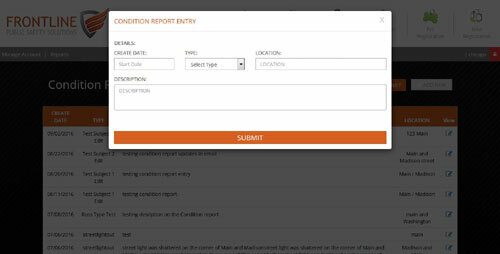 The report lists the Create Date, Type of Condition, Description of Condition and Location all in one easy to view window. The default setting lists the report by date, but also has the ability to be searched by Type, Location or Keyword. This is a great place to store all of the reports with the ability to provide access to the information from anywhere. 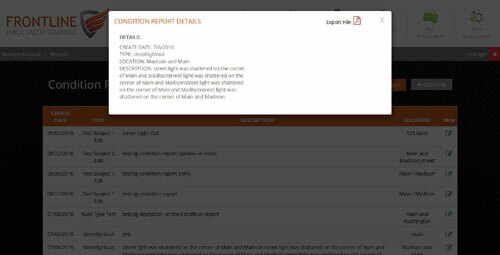 The Condition Report Details popup window offers additional information as to what is on the dashboard. The extra information may be helpful in learning more about the entry as well as adding what actions have been taken to resolve the issue. This page can be exported as PDF file to print or email the proper authorities. To create a new Condition Report, simple click the “Add New” button from the Dashboard page. This will open a dialog window for you to create a new entry. Once you submit the record, an email will be sent to the proper parties (determined in the manage section), and no other communication is needed for this condition report to be processed. As an Administrator level user, there are a few areas that need to be set up and managed. 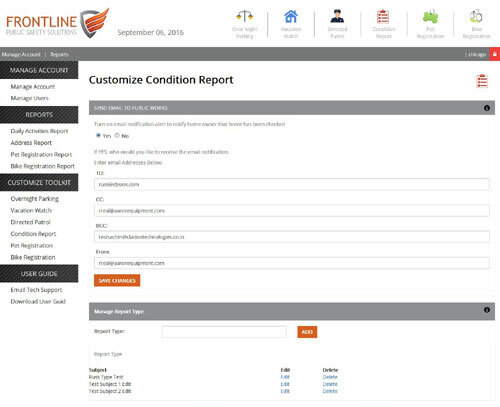 In most cases, when a Condition Report is created, an email will need to be sent to the proper people who will take action to resolve the issue. People such as the Public Works Department, Streets and Sanitation or the Police Chief may need to be notified. Here you have the ability to manage multiple email recipients who should receive notification that a condition report has been submitted. You also have the ability to manage a Dropdown Menu selection for the “Subject” of the Condition Report. Since each department and community is different, you can create your own Subject, Options, Codes, etc. however you see fit.